These free printable Christmas Cards to color are a great way for kids to personalize Christmas cards and Christmas gift tags for friends and family. Simply print, color, cut out and share! 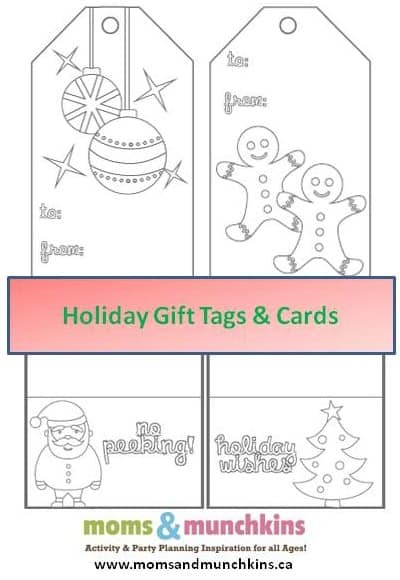 This free printable package comes with five gift tags and four Christmas cards. Kids will have a great time coloring these to hand out their own special Christmas cards this year. One of my favorite parts about Christmas has always been buying gifts for other people. Even before I was old enough to make my own money, my dad used to sneak me money and take me out shopping so that I could buy gifts for my family. I still remember the first time he took me out with my own little holiday shopping budget. It’s one of my favorite Christmas memories! For your little shoppers, I’m sure they’ll love their own personalize gift tags to attach to the gifts they’ve bought for their family and friends. These free printable Christmas cards to color are exclusive to Moms & Munchkins newsletter subscribers. Signing up is free & easy! Simply enter your email address, confirm your subscription, and you’ll be directed to a page with a link to the freebies page along with the secret password. This link and password will also be repeated in each of the monthly newsletters. A big THANK YOU goes out to the fabulous Denise of The CreativiDee Workshop for creating these printables for us. I love how she can take one of my ideas, put it into a printable format and it comes out even more adorable than I imagined it! She’s brilliant with printables for family fun. Visit her site for free printable organizers and so much more. We’re always adding new ideas for family fun. Never miss an update by on Facebook, Twitter, Pinterest, Google + and Bloglovin’.